Just as exciting as the masterpieces coming from our creative team is the expert support of those who are helping produce them. The Light of The World Foundation is sharing their expertise, the Main Street Art company are using their Utah foundry to forge the bronze statues and plaques, and Holdman Studios are creating many of the Stained Glass images. Masons, engravers and landscapers will be featured soon as well. Bios of each these craftsmen are below. We will be following each of these craftsmen with photographic journals and videos, so make sure you sign up here for the free, monthly e-newsletter “On the Isles of the Sea” which explores the people, events and sites of LDS England, Ireland, Scotland and Wales. Holdman Studios has been designing stained glass since 1988 and have been commissioned world wide to design and create various projects in glass, each unique in its own style and design. The studio’s glass hangs in all 50 states and countless countries world wide. Many projects have been done for commercial buildings, private residences, religious institutions and public art projects. Of most note is their continual work on the stained Glass windows of LDS Temples throughout the world. One of their most impressive projects has been the creation of The Roots of Knowledge windows unveiled in the library of Utah Valley University in November 2016. The 200 foot long wall of glass is a panorama of history and human drama. The intricate details incorporated into every window represent years of painstaking research on the events and people that shaped humankind from the days of woolly mammoths and cavemen to the iPhone. 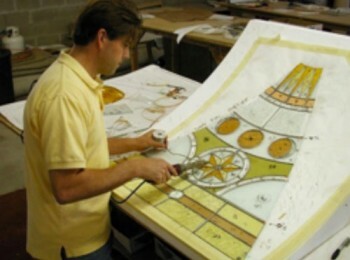 Under the supervision of Tom Holdman, the Holdman Studios team of artists designs every art glass window from scratch. Other noteworthy clients they have designed and built for are: the Roman Catholic Church, many Protestant churches, Thanksgiving Point, Wadsworth Brothers Construction, St. George City, the Clyde Companies and Brigham Young University. The I Am the Light of the World Foundation is a nonprofit 501(c)(3) corporation organized to build faith in Jesus Christ. It was founded in 2003 by sculptor Angela Johnson with the vision to build the Light of the World Garden at Thanksgiving Point, Utah. The Garden was dedicated by Jeffrey R Holland in September 2016. The Foundation is currently run by CEO, Mark L. Nelson, and governed by four board members (Gerald Nebeker, Marilyn Victor, Ruth Simmoneau, and Jessica Farnsworth). They look forward to continuing their mission by building more Gardens and other projects throughout the world. The Hartwood Pioneer Memorial Wall is the Foundation’s first international project. Since 1982 Main Street Art, Inc. has placed literally hundreds of sculptures throughout the USA and a few throughout the World. As one of America’s largest and most respected bronze foundries, they have developed expertise in Museum quality production, installation, maintenance, and restoration of current and historic work and have been trusted with some of the nation’s most important work. 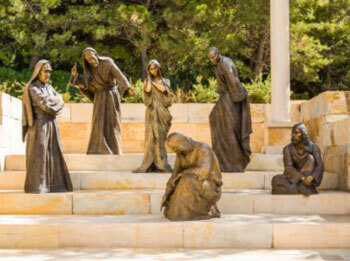 Many of the statues seen at LDS Church sites were produce under their watchful care. 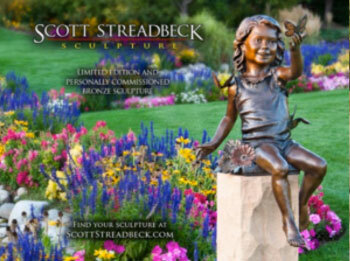 The founders and owners, Brian & Wendy Streadbeck, have supported and promoted the arts. Starting with Brian’s brother Steven, a master sculptor, the company expanded to include the promotion of the artwork of some of America’s best known and respected artists. Main Street Art has grown to be relied on as a source for artistic expertise in the area of Public, Corporate and Private Art collections. They have become an expert in selecting the proper artist or craftsman for each of the projects in which they are involved.